Krokstrom Klubb & Market was completely booked Friday night, after owners posted on Facebook that they were on the verge of closing for good. A string of bad weather events has taken a toll on finances at several area eateries. The cozy dining room at the corner of 36th and Broadway was buzzing on Friday night — servers darted from kitchen to table and a pink-haired bartender attended to a full bar. The scene was a welcome change for the owners of Krokstrum Klubb & Market, who earlier in the day posted on Facebook that they were on the verge of closing for good. “As long as we can continue to get people coming, we should be okay,” said owner Josh Rogers. 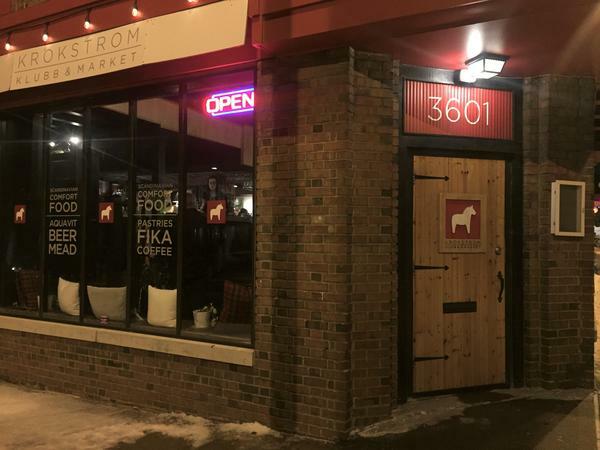 Rogers said that new restaurants opening all over town has slowed business at the nearly three-year-old Scandinavian spot. That, and a particularly dismal start to the year — slowed by bitterly cold temperatures, snow and ice — led to the decision to post the rallying call on social media. Rogers said even Restaurant Week, which is generally a welcome infusion of business during a slow time of the year, saw sluggish traffic because of snowstorms on both weekends. “The last two payrolls I haven’t paid myself because I wanted to make sure my employees got paid,” Rogers said. Local restaurant owners across Kansas City are similarly feeling the pain of an unusually slow month. Jimmy Frantze, who owns JJ’s near the Plaza, said on a single night during Restaurant Week in January, they had 180 cancellations. He said business the first six weeks of the year has been down at least 50 percent from last year. Frantze blamed the slow-down, in part, on the weather. Since the start of the year, Kansas City has experienced two big snowstorms, a polar vortex that brought dangerously cold temperatures, freezing rain and an ice storm. “Since we’ve gotten into February, it’s been brutal,” Frantze said. Frantze said after 34 years open, JJ’s is equipped to absorb the blow of a bad month. “But you have your ongoing costs, which everybody has, and they don’t change when the weather changes,” Frantze said. At Pirate's Bone, a vegan eatery and coffee shop near Brookside, owner Zaid Consuegra said business is down nearly 70 percent from typical winters. “We’ve cut down everyone’s shifts,” Consuegra said. Consuegra started serving food at Pirate’s Bone about a year ago. He said were it not for that revenue, they might not have made it through the season. “If it was just coffee like before, I don’t think we would have made … even rent,” Consuegra said. “It’s getting kind of scary where you’re juggling bills and it’s like, hoping that your vendors will understand that you’re going to be a little late because you hadn’t expected to lose some good days,” Rafael said. With Valentine’s Day approaching, restaurant owners are hoping for a needed pick-me-up in business — forecasts are calling for 55 degrees and a chance of showers.